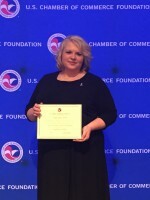 Paige Green, President/CEO of the Gilmer Chamber has been selected as an advisor at the June 2019 U.S. Chamber of Commerce Institute for Organization Management Southeast Site in Athens, GA. She is one of only 35 - 40 chamber and/or association professionals nationally selected to serve as an advisor. The Institute for Organization Management, is a professional development and leadership training program of the U.S. Chamber of Commerce foundation. Paige Green was a graduate of this program in 2015 and has been invited to return as a class advisor in 2019. "My four years at Institute were amazing," said Green. "I am beyond excited and honored to return as a class advisor." Nearly 1000 individuals attend Institute annually. Since its commencement in 1921, the Institute program has been educating tens of thousands of association, chamber, and other nonprofit leaders on how to build stronger organizations, better serve their members and become strong business advocates. Institute’s curriculum consists of four weeklong sessions at five different university locations throughout the country. Through a combination of required courses and electives in areas such as leadership, advocacy, marketing, finance, and membership, Institute participants are able to enhance their own organizational management skills and add new fuel to their organizations, making them run more efficiently and effectively. Institute for Organization Management is the professional development program of the U.S. Chamber of Commerce Foundation. It is the premier nonprofit professional development program for association and chamber professionals, fostering individual growth through interactive learning and networking opportunities. The U.S. Chamber of Commerce Foundation (USCCF) is a 501 (c)(3) nonprofit affiliate of the U.S. Chamber of Commerce dedicated to strengthening America’s long-term competitiveness by addressing developments that affect our nation, our economy, and the global business environment.